The Kinzie Street rail bridge and deteriorated bridgehouse. 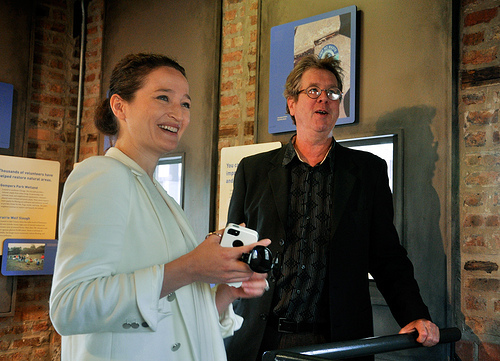 Our question asker Jim Brady with Ozana Balan-King, who helps run the McCormick Bridgehouse & Chicago River Museum. 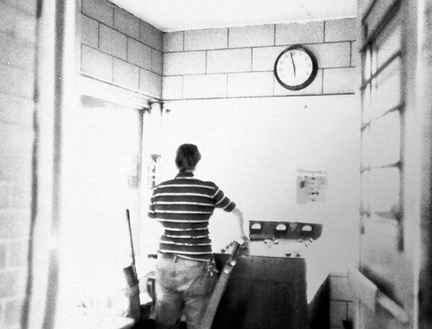 Bruce Lampson operating the former Z-1 bridge. His mom came to visit and snapped a few shots. A look at the former Z-1 bridge. If you’re admiring great architecture in the Loop, chances are you’re looking at skyscrapers. But if you crane your neck a bit less, you might notice an often overlooked catalogue of Chicago’s architectural movements. It’s the parade of bridgehouses along the Chicago River. Art Deco, Beaux-Arts, Modernism — all the major architectural styles that typify the city are on display in the bridgehouses that line the river. It can be enough to drive one to distraction, as it once did for Jim Brady. As we found out, the quick answer to Jim Brady’s question is: Most of the time, nobody! But these beautiful structures still serve a function. Stories about the downtown river bridges and the workers who once tended them solidify the claim that Chicago’s relationship with its river is every bit as notable as the one it has with Lake Michigan. Chicago has the most movable bridges of any city in the world. There are 37 in total, including 18 along the river’s main branch downtown. Most are of a style called Bascule, from the French word for teeter-totter — drawbridges that lift up instead of swinging to the side. Like a lot of its most impressive feats of architecture and engineering, the city’s record-setting collection of drawbridges has its origin in a very practical concern. “We had all these big boats coming through and a pretty narrow river, so you couldn’t really build those big bridge spans that would clear those large boats,” says Ozana Balan-King, a Friends of the Chicago River employee who helps run the McCormick Bridgehouse & Chicago River Museum. 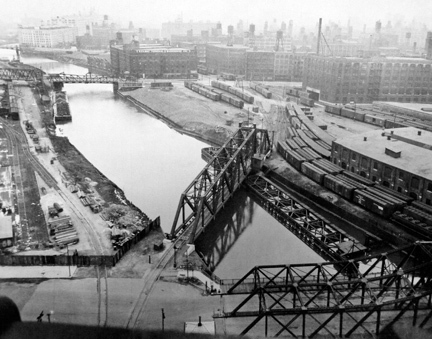 In 1920, the modern Michigan Avenue bridge’s first year of operation, it opened 3,377 times. Back then bridgehouses were staffed around the clock and opened on demand. But the law began to favor landlubbers over boat traffic on the Chicago River, especially as commercial shipping shifted south to the Calumet Harbor. Now bridges open only two times per week during a few months of the year: Between April and June, bridges open on Wednesday and Saturday mornings to let sailboats into Lake Michigan. On the same days from late September until mid-November, they open again so sailboats can return to the Chicago River system before winter. That system has been in place since 1994. Since they’re no longer staffed 24 hours a day, bridgehouses are usually unoccupied, though the 18th Street bridge is still staffed around the clock. During bridge lifts, seven crews from the Chicago Department of Transportation work to open and close 27 city-owned bridges. Crews leapfrog one another to keep the process moving, but it can take up to five hours. They start between 9 and 10 a.m. to avoid the worst of the morning and afternoon rush hours. Boat owners can talk to their boatyards about signing up for a bridge lift. To find out when lifts are scheduled, CDOT spokesman Peter Scales says to look out for press releases. James Phillips, who runs the website ChicagoLoopBridges.com, also tweets the dates of confirmed bridge lifts. Back when bridgehouses were staffed, bridge tending often meant more than just making sure boat traffic ran smoothly. From 1961 until he was drafted by the Army in 1965, Lampson ran the Z-1 bridge that used to carry railroad tracks northeast across the river just north of Kinzie Street. He grew up in the area and had learned to operate the bridge by watching people work the control panel when he was a child. Instead of going to high school, Lampson lied about his age and got the job when he was just 14 years old. He worked from 6:00 a.m. to 6:00 p.m. for six days at a time, earning two days off and $65 — not much less than his mother made working as a secretary in City Hall. In addition to opening the bridge, he sometimes had to direct street traffic with red flags when extreme heat or cold would jam the gates that kept motorists from driving into the river at the neighboring Kinzie Street bridge. But, he says, sometimes they did so anyway. He says he was once at his post on the east bank of the river when a man committed suicide. Z-1 was a bob-tail swing bridge that spun sideways instead of lifting up like a bascule bridge. It no longer exists, but the Z-2 bridge on North Avenue has a similar design. Boat traffic on the Chicago River has dried up a bit since then, and the crew that operates the city’s movable bridges has followed suit. Darryl Rouse, CDOT’s Assistant Commissioner and Superintendent of Bridges, said his staff is down from hundreds of employees during the 1970s to just 51 today. The days of sleeping or doing homework on the job, he says, are long gone — the crew is too small, Rouse says, to give bridge tenders any time to slack off. If our question asker, Jim Brady, wants a glimpse of the way things used to be, he can drop by five bridges in the Calumet system that are staffed 24 hours a day. Milwaukee also still has several staffed bridgehouses, although many of that city’s bridges are operated automatically or by remote. But maybe the bridgehouses themselves are enough, as Jim Brady and I learn when we tour the Bridgehouse Museum. Chris Bentley is a reporter for Curious City. Follow him at @Cementley.